Gene Simmons (far right) is ready to show off that infamous tongue come Friday night. Even if he didn't breathe fire, spit blood and flap his stupendous serpentine tongue constantly on stage, Gene Simmons would still have one of the most famous mouths in rock. • About his band's success: "We have more gold records than any other group in American history." • About the evils of alcohol: "I've never subscribed to the romantic notion of 'Wow, look at that guy, he's cool. He's wasted.' No, he's a loser, he's wasted." 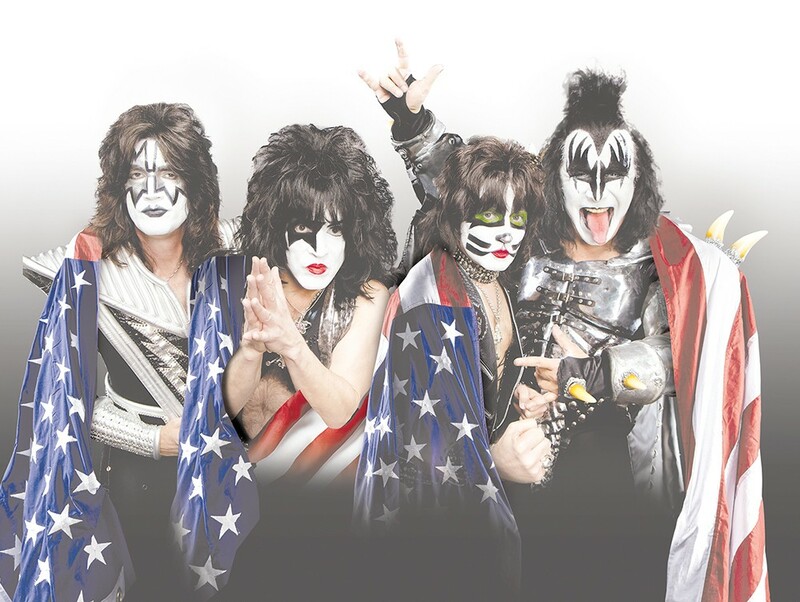 • About why he and Paul Stanley are the two original KISS members still going 43 years in: "Ace (Frehley) and Peter (Criss) were terrific in the beginning. We were all-for-one and one-for-all. And then a few years on, when all the big money and fame and chicks come along, no one says 'no' to your face. And self-destruction happened." This summer, the band renowned for monster-size shows full of lights and pyrotechnics is hitting smaller towns than typical. Simmons says it's a return to the band's roots. "It's how we cut our teeth," he says. "When we first started, we went to places that the rest of the world never heard of. Ypsilanti. Mankato. They're real cities, real cool people live there. And where you're born and where you live is every bit as cool as London, Paris, New York, except they get all the headlines." The hits will come fast and furious — "If I see the Stones and they're not playing 'Satisfaction,' I get pissed off" — so longtime fans can expect to hear classics like "Rock and Roll All Nite" and "Detroit Rock City." And even though Spokane Arena is no Dodger Stadium, the show won't lack its typical explosive eye candy. "We're bringing the full kit and caboodle," Simmons says. "Your girlfriend's been lying all these years, size DOES count, and we're bringing all of it." Still, there's no denying the entertainment value of a KISS show. Stanley and Simmons, along with guitarist Tommy Thayer and drummer Eric Singer, put in a hard night's work when they hit the stage. And while it doesn't seem like KISS will ever slow down, Simmons, now 66, admits that the end is in sight.